Tricks on tracks. 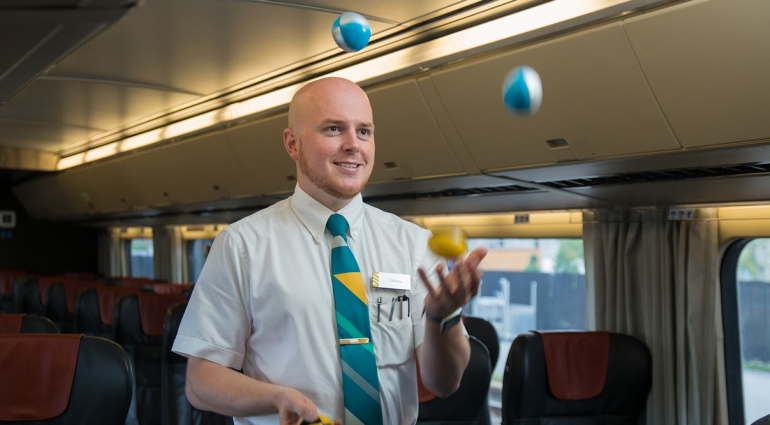 When it comes to entertaining the young and the young at heart, service attendant Zachary Wells has the magic touch. Literally. See him in action! 9 Comments on "Zachary Wells, Service attendant"
That’s great…makes you want to take the train! Thanks for your kind words Christine. Hope to see you onboard the train sometime soon. This guy is awesome!!! He’s hilarious, caring and attending & shows serious genuineness to attendants, I am a very regular customer of Via Rail and he’s definitely a great one! Hi Riham. So very sorry I never saw hour comment when it was originally posted last September. Very kind words you’ve shared there and I appreciate it very much. Hopefully will see you on the train again sometime soon. Super VIA trip trip Aldershot to London and Zachary Wells was the highlight! He is a delightful surprise. Thanks for the balloon corsage and smiles Zachary! Thanks so very much for you comments. I am pleased that I was the highlight of the trip and happy also to hear you liked the corsage. Looking forward to welcoming you back onboard sometime again. We had Zach entertain our kids yesterday on the train!! Highlight of the summer so far!! Thanks Zach from Leah, Emily and Ben!! Thanks for posting on the blog. It’s great to hear that this was a highlight of your summer. I’ve seen Zachary twice and he made the trips so much fun for everyone. Love to see him entertain, sometimes interject to attend to a train task, and then get back to the show. Now I look for him every time I travel VIA and am disappointed when he’s not on board!